A Chinese dissident turned documentary filmmaker is enjoying the nationwide opening of his award-winning, “Ai Weiwei: Never Sorry”, and will open Aug. 10 at Lagoon Cinema in Uptown Minneapolis. 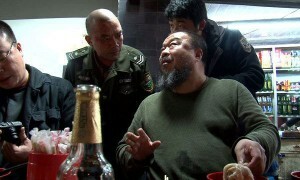 The film starring and Ai Weiwei directed by Alison Klayman, won the 2010 Sundance Film Festival’s Special Jury Award for Spirit of Defiance. Ai Weiwei is China’s most famous international artist, and its most outspoken domestic critic. Never Sorry is the inside story of a dissident for the digital age who inspires global audiences and blurs the boundaries of art and politics. First-time director Alison Klayman gained unprecedented access to Ai while working as a journalist in China. Her detailed portrait provides a nuanced exploration of contemporary China and one of its most compelling public figures. Ai Weiwei: Never Sorry was produced by United Expression Media & Never Sorry LLC, in association with MUSE Film and Television. Find out more at www.aiweiweineversorry.com and www.aiweiweineversorry.tumblr.com or Facebook and Twitter.